Fortunately, most animals have no difficulty delivering their babies without any help. 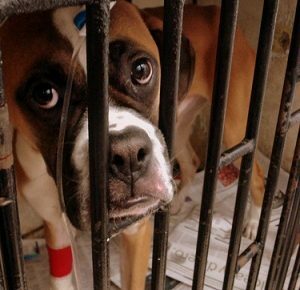 But there are some emergencies that can occur and some breeds of dogs that are at risk. Then a c-section (Cesarian or hysterectomy) is necessary. If your pet has been bred, she should have a complete physical examination at the veterinarian’s office. Gestation for both cats and dogs is between 63-65 days. Even breeds in the non-risk category should have a checkup at the vet. A serious situation may be avoided by an x-ray a few days before birth. At risk breeds include bulldogs and other brachycephalic (pushed-in face) dogs, small breeds. 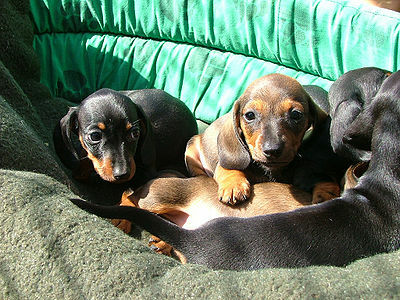 Puppies and kittens with large heads can be a problem if the mother’s pelvis is narrow. In these cases, it may be advisable to make an appointment for a cesarean section beforehand. Even breeds in the non-risk category should be checked by your vet. A serious situation can be avoided by an x-ray a few days before the birth is expected. In cases where pets are expected to have a difficult delivery (dystocia), a cesarean section is recommended. A planned c-section is safer because staff is available to help, the female isn’t exhausted from long hours of straining to deliver babies, little risk of babies being stuck in the birth canal or having the placenta detach. The surgery is prepared beforehand and equipment is set up and ready. A few days before whelping, your pet should be x-rayed for number of babies and sizes. Signs that the female is ready to give birth are 1-2 weeks before, the mammary glands will enlarge and there may be milk secretion; 12-24 hours before whelping, the female can be restless, refuse food, have a temperature below 99 degrees Fahrenheit. Watch the female for any abnormal signs. Your vet will give your dog or cat a thorough examination to determine if it’s possible to use other medical methods rather than surgery. As in all surgeries, your pet will have its vital signs monitored during the procedure. 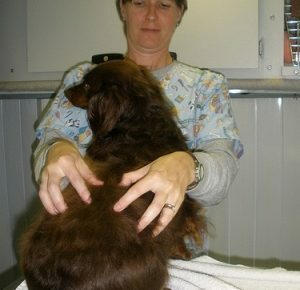 In some cases, the surgeon may recommend spay which can be performed after the babies are delivered. Gas anesthesia is used during a c-section because it causes minimal problems. Any anesthesia will be transmitted to the fetuses and can affect unborn babies causing lowered heart and respiratory rates. Minimizing exposure time of delivery helps. Newborns are delivered with placental sacs and amniotic fluid. The surgeon and staff remove the sacs and aspirate fluid from the mouth. If stimulants are necessary for newborns to begin breathing, they are administered. As soon as the mother recovers from surgery, the babies will begin to nurse. Mother and babies are sent home the same day. At home, the mother should be allowed to rest as much as possible. Limit activity for the first couple of weeks. Recovery from the anesthesia is usually 2-6 hours depending on the mother’s age, how long she was in labor and her physical condition. Offer small amounts of water and food frequently. Check often to make sure the mother doesn’t roll over onto the babies and crush them. Watch the incision for any redness, swelling, discharge or pain. Prevent the mother from licking or chewing the incision site. Use a special collar if necessary.